On the morning of June 11, the Parallel Session on City Credit Monitoring and Practice of Forum for Credit System Construction of Chinese Cities was held in Fuzhou. The Vice President of the State Information Center (SIC) Zhang Xueying presided over the forum and made concluding remarks. Zhang Xueying noted that credit systems in various cities and regions are at different stages of development and have different credit environment, while the integrity and morality levels of local citizens vary. City credit monitoring helps better comprehend the baseline of their credit construction, pinpoint problems, and summarize the law of development, offering new ideas and new approaches for city credit construction. He said that in recent years, commissioned by the NDRC, China Economic Information Network has carried out nationwide city credit monitoring and evaluation, which has attained effective results in promoting the construction of city credit system. He hopes that leaders in all cities could continuously pay attention to and support the monitoring work, regard the construction of city credit system as a crucial part and leverage of city governance and development, and improve the design of city credit system, so as to lay a solid foundation for the healthy and sustainable development of economy and society of cities. During the forum, members from Financial Department of the NDRC made an overall introduction of the current construction work and its requirements on city credit system. Head of Big Data Research Center of China Economic Information Network presented the theories and approaches of city credit monitoring and evaluation. Leaders in charge of city credit system construction in Beijing, Shanghai and Nanjing also shared their experiences in city credit construction. 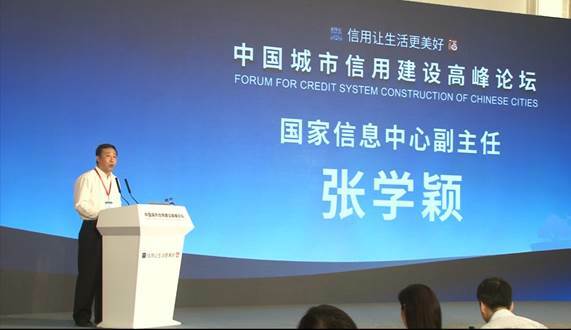 Also present at the forum were leaders from leading departments on social credit system construction and public credit information departments, related bodies of various provinces, sub-provinces, provincial capitals, prefectures covered by national city credit monitoring platform, first 12 demonstration cities of social credit system construction and other demonstration candidate cities.